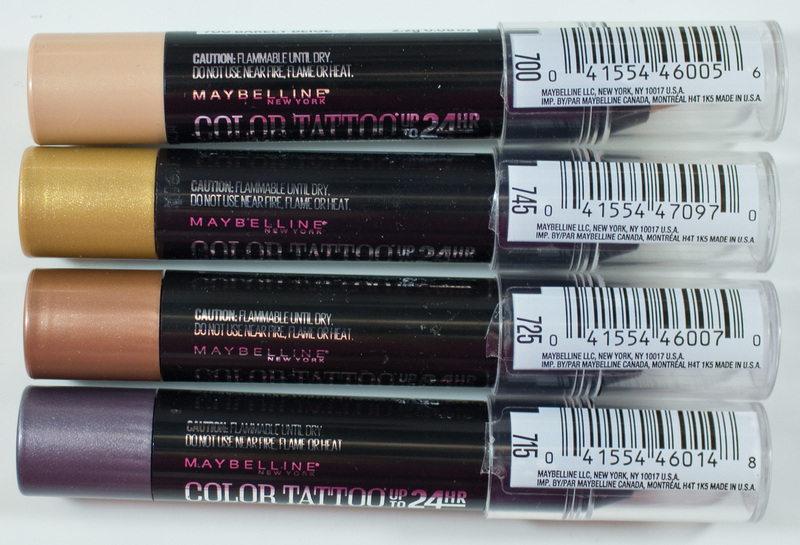 Maybelline Eyestudio Color Tattoo Concentrated Crayon in Barely Beige, Gold Rush, Bronze Truffle, & Lavish Lavender. The Maybelline Eyestudio Color Tattoo Concentrated Crayon retail for $6.99US and $8.99CAN at Zerhs for 2.2g / 0.08 oz of product. C11-12 Isoparaffin, Trimethylsiloxysilicate, Beheneth-5, Polyglyceryl-3 Stearate, Polyethylene, Phenyl Trimethicone, Paraffin, Isododecane, Cera Microcristallina / Microcrystalline Wax / Cire Microcristalline, Synthetic Fluorphlogopite, Silica, Alumina, Glycine Soja Oil / Soybean Oil, Retinyl Palmitate, Tocopherol, Isopropyl Palmitate, Calcium Aluminum Borosilicate, Tin Oxide, Aloe Barbadensis Extract / Aloe Barbadensis Leaf Extract. May Contain: Mica, CI 77891 / Titanium Dioxide, CI 77491, CI 77499 / Iron Oxides, CI 77000 / Aluminum Powder, CI 19140 / Yellow 5 Lake, CI 77288 / Chromium Oxide Greens, CI 77510 / Ferric Ammonium Ferrocyanide, CI 77510 / Ferric Ferrocyanide, CI 42090 / Blue 1 Lake, CI 75470 / Carmine. These Pencils are a wax/gel hybrid based formula that set once it's blended out on bare skin or eye primer. 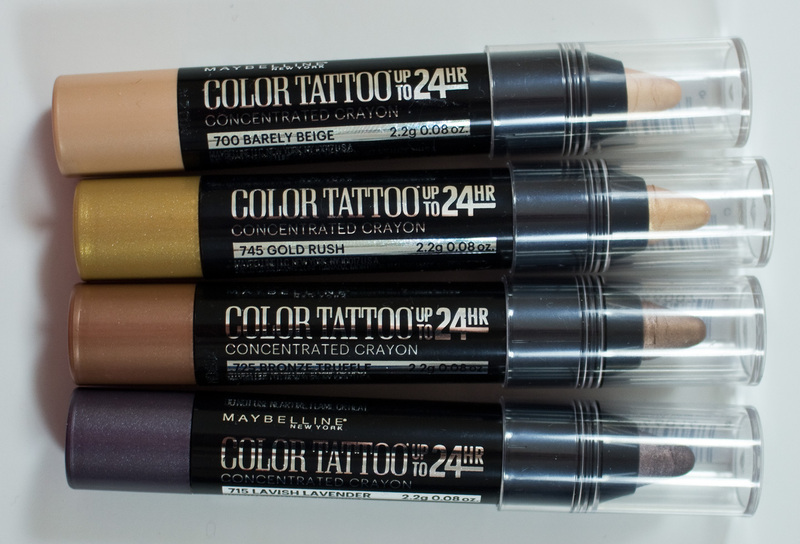 The texture is very smooth when working with all 4 of these shades. Barely Beige is a pale beige with a pearl finish. Gold Rush is a gold beige with a shimmer finish. Bronze Truffle is a cool bronze brown with a shimmer finish. Lavish Lavender is a is a duty lavender with a white shimmer. 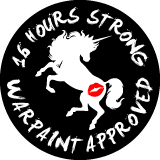 Wear: Close to 12 hours wear on their own, lasted 16+ over a primer or set with a powder shadow. Daylight swatches: Barely Beige, Gold Rush, Bronze Truffle, & Lavish Lavender. Flash swatches: Barely Beige, Gold Rush, Bronze Truffle, & Lavish Lavender. 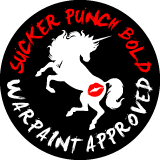 If you like the original Color Tattoos these are a dustier version of most of the shades that can be found in that range. They also better at blend out with your fingers or a fluffy brush.